There are a million articles on finding your passion but once you’ve identified what it is you want to do with your life, how do you make your passion your paycheck? 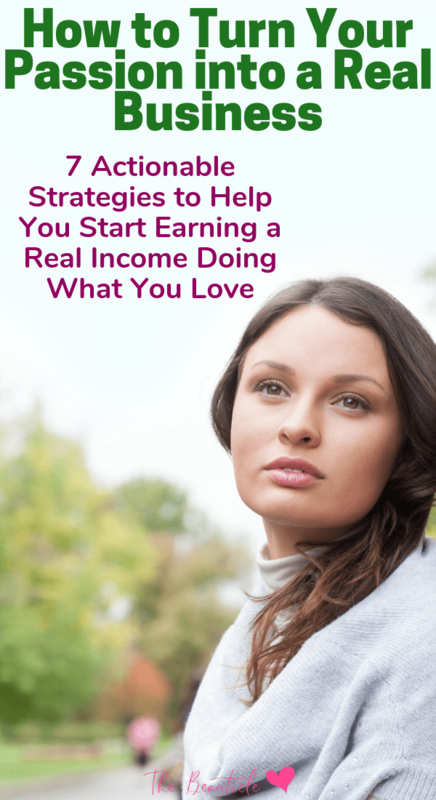 These strategies outlined below will help you to do what you love and make money turning your passion to profit. Do you know exactly what you want to do with your life but you have no clue how to turn it into something that makes money? It seems that there are so many articles helping you to find your passion, but once you do now what? This article will help you to turn your passion to profit by giving you some strategies to monetize your dream. There are different strategies outlined for those who want to be an entrepreneur and those who want to climb the corporate ladder in a career or field you love. Make money from home, make money online or make money in business but by the end of this post you’ll make your passion your paycheck or at least have a plan to do just that. What would you do every day with your life if money was no question and you knew you would not fail? The answer to this question is often your passion in life. It takes some amount of self-discovery to truly get to the bottom of this question so you may want to explore it deeply and spend some time experiencing the answer you have come up with to make sure it is truly your passion in life. Now that you’ve identified your passion and you’ve decided that you want to profit from your passion, it’s time to figure out how to make a career from it. Identify the practical skills behind your passion pursuit in case you need licensing, training or further education on your passion before turning profit from it. Once you’ve done this, you can consider having it make money for you. Don’t be afraid of being very unique with your passion. The really cool thing about any kind of specialized interest is that there are other people out there who share that interest. When your interest is really unique, it can be a very niche market but those people are also often very involved in their unique interests. If your passion is in a more general arena, there are lots of ways to make money from it. This is an easy way to slip into your dream career by learning from others already in the field. Search LinkedIn, Craigslist and job sites for careers in your passion field. Look up the job descriptions of those in your dream career so that you can embody the character traits that these people have in common. This will give you an edge when applying to these jobs. If you’re unable to find a job in your field easily, consider volunteering some time doing what you love. This brings you within the field gathering experience and making connections, bringing you closer to your ideal life. Websites like Podia allow you to start memberships where you can create content and charge you supporters for accessing this content. This makes it easy to get started, no tech required. If you prefer, you can create your own website to share information on a regular basis for a monthly fee. Creating a website is as simple as signing up for a domain name and website hosting here. If you enjoy flying and building kites for instance, you could consider creating a membership site where you post weekly tips on how to build better kites. Membership programs are great because they create income that comes in on a regular basis. As long as you continue to provide valuable information and good service to the members of your list, you’ll have a steady stream of income. One way to get attract members is by attending events, festivals and conferences in your field. There are conferences and events surrounding every hobby and passion pursuit and these provide great networking instances. This free email marketing course will help you to get started. Blogging is very popular and can be a great way to share your knowledge and passion while making money from it. With a blog you can make money promoting other people’s products, selling ad space or selling your own products. Plus, by blogging about something, you get the opportunity to showcase your knowledge and discuss your passion. This will help you to build a community who may join your membership site creating even more streams of income. Learn how to create your own blog here. Ebooks are a great way to share your knowledge about a topic easily and independently. Typically, ebooks aren’t expected to be hundreds of pages long which make them much easier to write than a novel. The length isn’t as important as the quality of information but it should be more than just a few pages to make sure the buyers of it feel they’ve gotten their money’s worth. As you know, many people purchase and read ebooks on their computers, smartphones or tablets on a regular basis especially on Amazon Kindle where anyone can self-publish an eBook. The key is to ensure that the information being provided is valuable. Even if you’re writing on a topic that you’re very knowledgeable about, do some research to make the book the best it can be and sell it on the quick wins that people will be able to get from reading your book. If you prefer talking to writing, a video course is another way to monetize your passion. All you need is a camera that can shoot video, a tripod and an easy video editing program. Most computers (both MAC and PC) come with a basic video editing program. I use Shotcut to edit my videos which is a free open source program with lots of Youtube tutorials. You can then upload your video course on a free platform like Thinkific who not only host your video files and course material for you but also handle collecting payments. Determine the goal of your course or your desired outcome. It helps to know the end result of the course then you can work backwards. Write out the steps required to meet your desired outcome. Make sure you write it in the correct order as if you’re going to tell someone how to do it in writing. Decide how many videos you want in the course. Try to keep the course nice and tight but don’t cram too much information in one video. Ideally, an online video should be no more than 8 minutes long. Create a plan for what you will cover in each video. Don’t write a script. You will be tempted to memorize it and won’t sound natural in your videos. Give yourself an outline to make sure you touch on all of the steps. Now that you have everything you need, it’s time to record your videos. Make sure you do it in a quiet room with good lighting. Be clear but concise in your instructions. Practice a little if necessary. It might be odd to see yourself on camera if this is your first time so do some test runs to get used to it. If you don’t have a video camera or don’t want to be on camera, you can do a webinar course that doesn’t require that you be on camera in person. You will need to provide your voice and expertise, but that’s it. The steps to creating a webinar course are similar to creating a video course. Determine the goal of your course or your desired outcome. Decide how many modules you want in the course. Try to keep it nice and tight and don’t cram too much information into one module. Create a presentation in PowerPoint or a similar program. This will be your plan but also provide visual materials for the people who will be participating in your webinar. If they can’t see your face, they should have a cool presentation to see. Once you have these pieces organized, use a program like Zoom or WebinarJam to host your webinar. Both have free options which have limitations but may work when you’re just starting out. If you’re unsure how your products should look, do a web search for others that are similar to what you’d like to create. The web is a great repository of products that have been created and can be used to provide an example that you can work from. There are tons of free webinars that are used as precursors to larger cursors so watch a bunch to get a feel of them and how they work. If you’re an expert at something and passionate about it, chances are there are others who love it just as much as you do who want your knowledge. Consider offering becoming a business coach and offering 1on1 coaching to those who want to learn more about your passion. Do some research in your field to see what is currently offered as there are coaches for every topic under the sun. This research will also help you to price hour coaching services. You can get clients from social media, your website or networking events. Once you begin to make money from your passion you can figure out how to scale your business or grow in your career. These strategies should help you to get on your way to make your passion your paycheck.